Visit us at The Complete Aquarium headquarters for a free consultation. Discuss your vision and we will make it a reality. 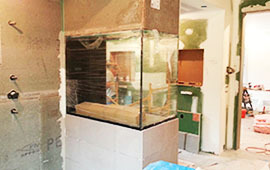 Our company works with designers and construction crews to fit a custom aquarium into your home or workplace. Choose from a variety of styles such as “in-wall” aquariums, cylinder, half-cylinder aquariums, moon view, or traditional. After consultation and design plans are finalized, we will install the aquarium into your home. Skilled in plumbing, electrical, construction and aquascaping, our team has the skills to get the job done. Once your aquarium has been installed, it will be filled with high-quality saltwater, sand, and live rock. Next, you'll choose from a wide selection of corals and fish. Enroll in our service plan to keep your aquarium clean and healthy. The Complete Aquarium service plans — weekly, bi-weekly, and monthly — are the key to a successful reef aquarium. During each service, water and filter media will be changed. 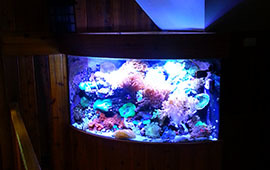 Algae is cleaned from the aquarium glass to provide a crystal-clear view of your reef. We make our own high-quality saltwater for our aquarium services, or you can contact us to develop a mixing station that allows you to produce high-quality saltwater in your own home or office. 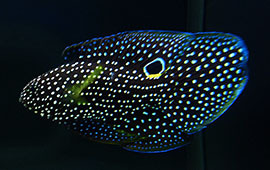 Routine service will help to ensure the well-being of your reef aquarium. Just because the aquarium looks clean does not mean that a service is unnecessary; it is crucial to service your fish tanks on a regular schedule.